No New Entries Will Be Accepted. Thanks so much to our wonderful sponsor BedLounge, We look forward to working with you again! The winner has been notified and upon confirmation his/her follower name will be posted both here and on our homepage. Remember: There are still some great giveaways active on the upper right hand side of the page! I am an avid reader and writer. As we all know inspiration strikes at the strangest times and places. Like many of you, sometimes my greatest ideas come to me when I'm in bed and I bolt upright and begin to write. It's usually on my trusty laptop (which recently died on me! but that is a post for another day!). When I am trying to use my laptop in bed it's sometimes very difficult to sit upright comfortably. Even with a lapdesk, I end up slouching or sitting in awkward positions to balance the laptop and write. This just won't do as far I'm concerned. I have great pillows, but stacking them up still doesn't allow me to sit upright ergonimically like when I am working at my desk and sitting on a task chair. The Bed Lounge® is a breakthrough in fully adjustable custom comfort and revolutionizes sitting in bed. Ergonomically designed by leading back specialist Dr. Robert Swezey, MD., the BedLounge® offers a lightweight and highly portable way to have extraordinary comfort and support in bed or...wherever you sit! 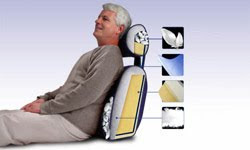 The Bedlounge® is adjustable, has moveable head, neck and lumbar supports and allows for a custom fit. The new FLEX ARM or Pivoting Arm Rest Feature has actual hinges allowing the arms of your BedLounge® to effortlessly pivot back and forth or to act as living hinges, moving as needed. They automatically return to their resting place when not in use. The buttoned side pockets can store magazines, remote controls, baby bottles, reading glasses, pens, pencils, calculator, or even the Sunday Times. The Bedlounge® is completely portable and folds up for easy storage - take it anywhere, it weighs less than 8 pounds! Constructed with aircraft grade open cell foam supported by a strong, lightweight internal polypropylene frame. Adjustable neck and lumbar support sections are layered with down feathers and pillowy combed fiber. There is a fight for this in the house which means I'll probably have to order everyone a Bed Lounge® of their very own! I can attest to quality construction, mine gets heavy rotation and appears no worse for wear. I totally stuff way too much in the side pockets and they have not torn (I can't say that for some jeans I wear! ), and the fabric cleans easily! WIN IT! - Ascending Butterfly and our friends at The BedLounge®, wants to help you work in bed in ergonomic comfort and support! One lucky 'Ascending Butterfly' will have the chance to win a Bed Lounge® of their own! Can't wait to win? I certainly can't blame you, the great folks at The BedLounge® are offering Ascending Butterfly Readers an EXCLUSIVE code just for us! Entering the code: BUTTERFLY will give you 15% off any Bed Lounge®! But HURRY the code expires Jan 22, 2010. How to Win: (1) You must be a follower of Ascending Butterfly to be eligible for this and all giveaways. Indicate in your entry that you follow (if your 'comment name/user id' differ from your profile id, please let me know what name you follow under) and (2) Visit BedLounge.com and pick your color and fabric preferences for your Bed Lounge® and post in your comment what color and fabric you would want if you win. (3) You must also leave your email address somewhere in your comment. (You can format it this way for security, example: ascendingbutterfly AT mail host DOT com). Please follow the easy 1, 2, 3 steps to winning! This giveaway is open to USA residents who are 18 years of age or older. Ƹ̵̡Ӝ̵̨̄Ʒ - Subscribe to receive Ascending Butterfly emails using our Feedburner widget on the upper right hand side of the page below the follower thumbnail pictures! This is NOT a paid endorsement/insertion. All opinions are expressly my own! The BedLounge or this review should not be considered medical advice or substitutes for recommendations of an attending doctor, nor as specific endorsement of any treatment. I am following you on Google Friend. I really like the Cotton Print. I am following you on Google Friend. i like the Cotton Print. I'm a follower of Ascending Butterfly! If I won, I'd love to have the BedLounge in Black Cotton. I like the natural microsuede. I follow as captaincarebear and add that as a yahoo account. Navy jacguard is the one that I would love to have. I am following you on Google Friend. I twittered about your giveaway on twitter. I subscribed to your blog via feedburner. I would choose the Burgundy Velour Fleece. I would like to have it in Denim cotton (would really prefer the velour but not the colors it is in). I'm a follower on Google Friend Connect. I like the Natural Velour Fleece best. Thanks! I'd choose the natural microsuede. Thanks for the chance. I would pick the Denim Cotton. e-mail Subscriber! I love the Black Velour color. Folloing on Google friend connect! Fan of Ascending Butterfly on FB! I twittered about this giveaway today. I love the Blue fabric..so pretty! I am a follower on Face Book under Johnica Dingus. I like the natural cotton. Thanks! I follow on google (Stacy) and like the natural cotton. Tough decision! I would probably choose the Green Velour Fleece. I am following your blog on Google Friend Connect (username Nelsby). I shared this post on Digg (username Nelsby). I voted for Ascending Butterfly on Fuel My Blog. I follow you on Facebook (Aimee Waerhouse). I follow you on Facebook via Networked Blogs (Aimee Waerhouse). I joined your Ning group (username Nelsby). I follow on Google Friend. I'd like the Navy Velour Fleece. I'm a follower and I love the black jacquard lounger. I'm a follower. I would love the bed lounger in natural velour fleece. I would choose the natural colored 100% cotton bedlounge! Happy New Year. I think the burgundy cotton is very nice. Burgandy Microsuede. Love to have that one. Daily vote: I as Downy vote #368. I really like the natural microsuede. I'm a follower, subscriber, etc. of yours and my hotmail email is in my blogger profile, jennifer228. I couldn't find your blog on technorati... maybe if you posted a button I could add you. and for the Bedlounge I would pick the Burgundy Microsuede. I voted for your scent on the downy widget but It still says 371 votes and that's what it had before I voted so I hope it shows up. I think I'd like the velor fleece on in natural. Would go with any decor. I couldn't find the favorite button on technorati... the site has changed. I did leave a positive review for you, though, if that counts. I would love to win the green cotton one. I follow on Twitter_Sarafan2 & Face Book- Kelly Coleman. the colors I chose are Navy Blue & Burghandy in Fleece. If I won, I would probably choose the Navy Blue Bed Cover in Fleece. I bet my back would love it if I won this. Thanks for the chance. I follow Tracy Iglesias on Twitter. Follow Ascending Butterfly on FB. Follow Ascending Butterfly on FB Networked Blogs. Hi Tracy. This is a great giveaway and now that my 89 year old MIL is living with us she could really use this. I'd love to have one in the natural cotton. I'm a new follower, following as Tracy Suzanne, Cotton Pickin Cute, it may show up as tonasun. My email is cottonpickincute@hotmail.com. P.S. Thanks for stopping by and I'm so glad you'll be following. I hope we become good friends. i also subscribe to e-mail newsletter!